A good example of this could be the GBA remake of Final Fantasy. By the end of the game, you will have probably faced twice the number of Black Goblins compared to every other monster in the game. These goblins are in the bonus dungeons (where they offer no challenge) and are in the starting areas (where you are likely to grind.) Even if they were slightly dangerous at the start, they are only wasting the player’s time by the end of the game. By the end of the game, there’s an item that casts cure. This means that 99% of average battles amount to curing damage, and having the party attack. Boss battles are pretty easy if you do the bonus battles, so they amount to buffing, a bit of magic, and the monster dying. Obviously, there’s more strategy if you pick a more difficult party or avoid the bonus battles. Unlimited Saga has a reel system. This represents things like missing an attack (not getting the panel you wanted), getting a better attack than you intended (a better panel than the basic), and a randomizer that can allow you to set up combos via lining up multiple reels. When people say you “mash X” to get through a battle, they could mean a number of things. They may mean that each battle has one strategy to complete it. 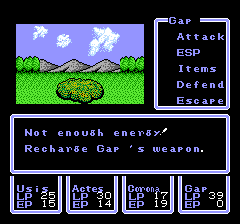 So, for example, in Final Fantasy, it may be “use item that heals,” attack, attack, and attack. A game like Pokémon, on the other hand, encourages a different strategy with every battle due to type weaknesses. 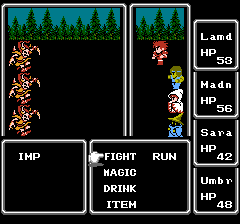 They may mean that the battle system has a menu with a basic “pick item on menu to execute attack.” The Dragon Quest series, for example, tends to have very “visible” menus that cover a fair amount of the screen space. Timing elements, real time attacks, or strategic positioning are all ways that people vary this system. 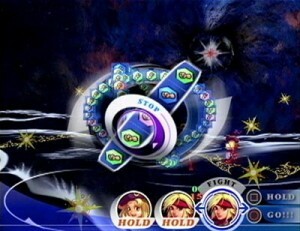 Another form of “mash X” is a game that has many button presses per attack. An example of this might be Wizardry 7. On average, each character needs to pick their attack, type of attack, and then execute all the character’s strategies with every round. This means, thirteen selections (two per character and one to execute the actions) for every round. That’s not including magic, mind you. STED wastes your battle turns fairly often. Attack an enemy that is dead, and you've wasted your turn. Don't charge your weapon first, and waste a turn using a battery on it. Now, here’s where a problem comes up. Sometimes, “mash X” isn’t a bad thing. After all, a strategic battle system like Wizardry 7 may be fun enough that you don’t care about the amount of buttons you have to click to execute the attacks. The Tales series has a real time system that’s often flashy and quite fun to watch. Usually you’re just hammering a attack or a group of attacks, but the visuals and the timing aspects make it fun. If you’re playing a retro-style game, you may not want to have flashing timing elements, and you may just want to pick attack and have things get attacked. Sometimes, a complex game starts out with a “mash X to win” style tactics and ramps up the complexity. The reason why I’m thinking about this is actually due to Nostalgia. This DS game mimics retro-styled RPGs with a charming fluffy steampunk flavored plot. However, flying around in your airship quickly gets annoying. First of all, it’s fairly slow, and you often are stuck sailing around large parts of land trying to find stuff if you’re doing side quests. The airship gets more stats from plot advancement (so, for example, you get a new town, and you can buy new engines and weapons.) This means that if you’re lost, you can get attacked by unusually strong enemies. The battle system is usually quite easy, so the airship fights are almost like a boss battle. However, they’re really not that exciting. Elemental attacks aren’t that strong, and most special attacks aren’t that strong against other airships. So, most fights amount to buffing up, slowing down the enemy and then slowly pinging away at the monster. The treasure and experience rewards are usually pretty good, but you’re looking at something like ten rounds of battle per fight for an area that is near your area of the plot. You can die pretty easily if you aren’t careful, but the “careful” path either uses a lot of magic points and takes a long time. The more economical path takes even longer. So what’s the problem with the system? You are forced to stop and recover magic and the airship pretty often while exploring, which wastes time. The battles are tense, but pretty boring if you’re prepared to fight them. However, you can’t relax since they’re still dangerous. Each attack takes a fairly long time due to the animations. Add in the fact that there’s a bug that has the game occasionally crash while flying – and you can see how a strategic, difficult, and complex battle can be irritating. What’s a “good” button mashy battle system? For me, it comes down to customization. If I can customize how I deal with fights, if I can customize the noise volumes, and if I can speed up the text speed, then I’m pretty happy with the game. If the text is slow and I can’t speed it up, it gets slow and more annoying, and I mash the buttons more often (to speed stuff up.) If I can’t turn off sound effects and they are annoying, it’ll get more annoying when I hear the squeaky attack sound yet again. If a mage is useless without magic, and I can’t be fairly self sufficent as I explore, I’ll be irritated. I don’t like backtracking slowly to heal, and I don’t like running out of MP and suddenly being barely able to win a fight. In Etrian Odyssey, you could be completely self sufficent. With three rounds, and a high enough level, you could have a net MP and HP gain from every battle. In Etrian Odyssey II, you could not be that self sufficent. Etrian Odyssey was mostly based around buffing and outlasting the enemy. Etrian Odyssey II is based around a strong desperate attack. Both games are pretty “button mashy” and aren’t that flashy animation wise. However, the former is a lot closer to my ideal system.